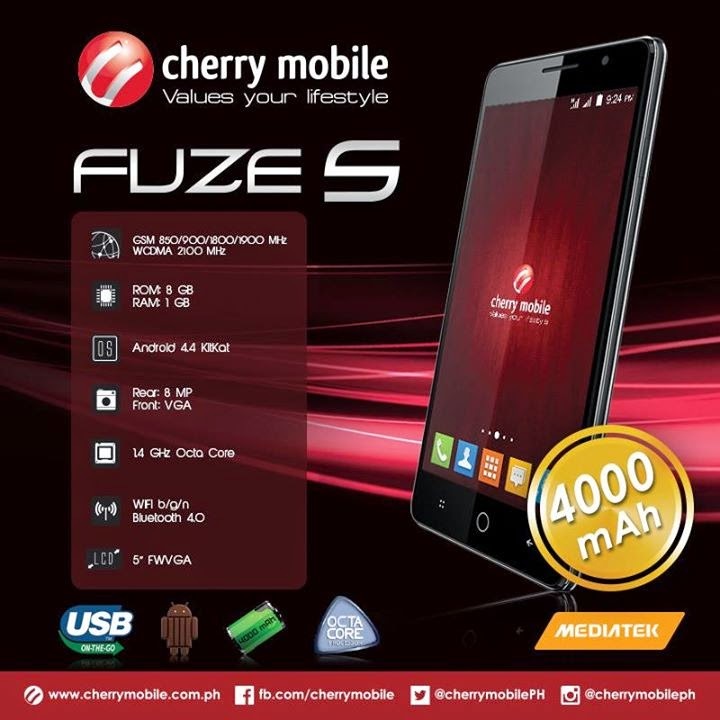 Philippine phone manufacturer, Cherry Mobile has just reveal a new smartphone packs 4,000 mAH battery with octa processor, the Fuze S.
The device features 5 inches FWGA display with Android Kitkat operating system. As mentioned, Cherry Mobile Fuze S is powered by a Mediatek 1.4 GHz octa-core processor, coupled with 1GB of Ram and an 8GB internal storage. If the memory is not efficient for you, a micro SD slot is available that can support up to 32 GB. In addition, the device have 8 megapixel rear camera while a VGA camera on front. For ₱4,499 price tag, it also support USB OTG.